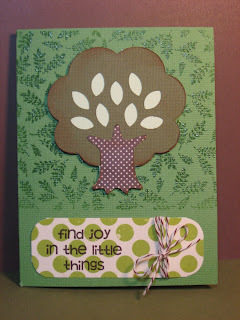 This very very simple card is made using American Crafts "Lucy Hootski" paper. It is an older paper that I got on clearance, but I had to have it because it just makes me smile!! Here is a thank you card for a volunteer at my church. I used Microsoft Word to print the sentiment on this card. I then ran the cardstock through my printer. The paper is the Cosmo Cricket DeLovely 6 x 6 Mini Deck. I used the Stretch Your Imagination Cricut Cartridge for the watering can. 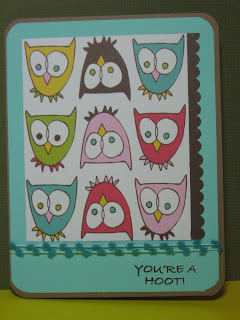 For this birthday card, I am using a faux metal technique that is perfect for cards or scrapbook pages. The technique uses silver embossing powder. The process is a little time consuming, but the results are really amazing!